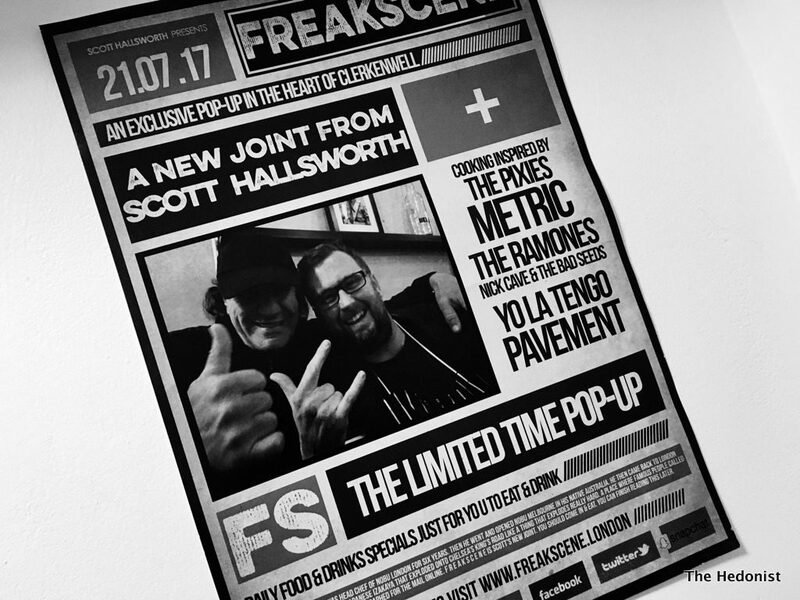 The chef behind FreakScene is a chap called Scott Hallsworth who was head chef of Nobu in Park Lane, London for six years. On returning to his native Australia Scott opened Nobu Melbourne and then came back to London and created Kurobuta, a fashionable Japanese Izakaya on Chelsea’s King’s Road. 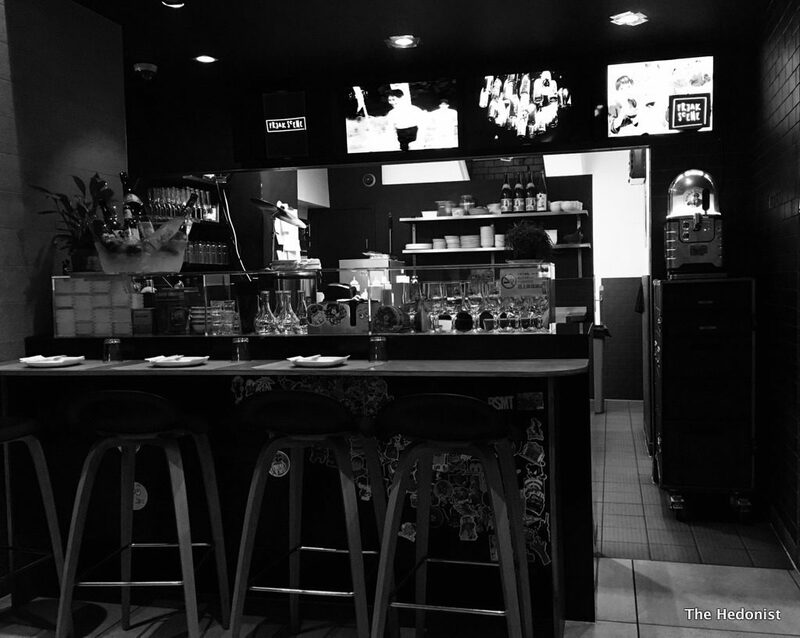 Kurobuta called itself a ‘Rock’n Roll Izakaya’ and with neon lighting, flight cases strewn artfully around the space, AC/DC on the turntable and Japanese tapas style plates it lived up to its billing. Other branches opened as the group expanded but Hallsworth is no longer on board and no-one is spilling the beans as to what happened between Hallsworth and his backers. 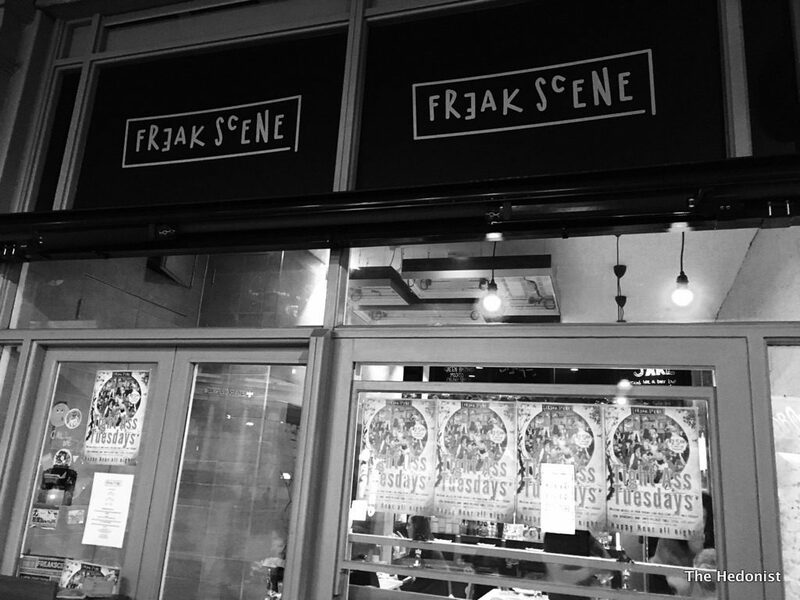 However he has swiftly made a comeback with FreakScene, a pop-up café near Farringdon station that continues the Kurobuta narrative but in a more low key and more amusingly put together space that avoids some of the rock’n roll clichés of its predecessor. The cooking is apparently ‘inspired’ by The Pixies, Nick Cave and The Ramones though how that that translates on to the plate is beyond me and I’m doing a PhD in popular music…! I guess it’s meant to be about attitude…but I’ve been asked to review and want to see and taste what his next move is. The menu is short and sweet and is Hallsworth’s latest take on Nikkei cuisine, that South American/Japanese fusion that is he majors in.The manager amused us with stories of his Jamaican grandmother and seduced us (not hard) into trying a delicious Sake cocktail (£9.50) – sake, pink grapefruit, sugar syrup with its light citrus notes not overwhelming the delicate sake flavour. Chili crab and avocado wonton bombs (£6.50) were first out. Spicy mouthfuls of crab, with a good mix of the more flavourful brown meat, and soft avocado sat in the crunchy wonton wrappers. 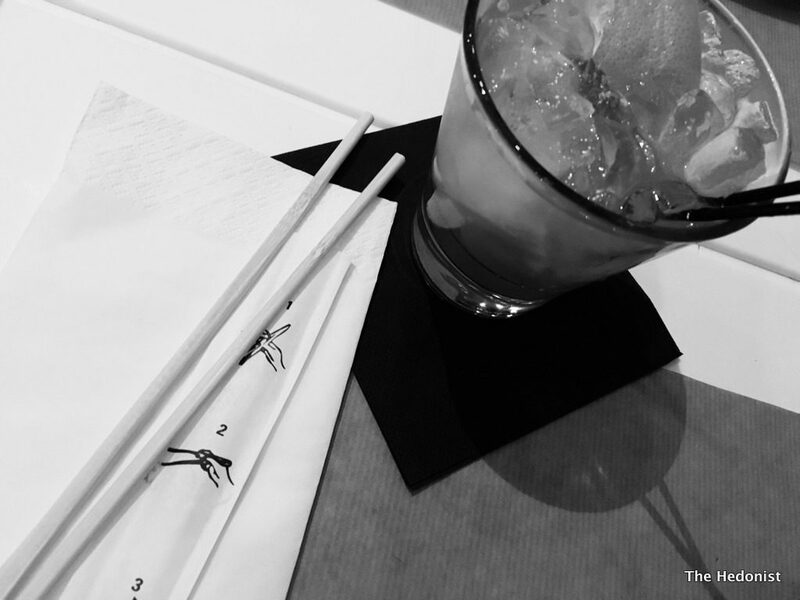 Crunch, heat and flavour – a combination that set the theme for the evening.We sank a glass of floral Konishi Silver sake to accompany the ‘bombs’ which was an elegant match. Miso grilled black cod taco came with sushi rice, scorched red chili and tomato salsa (£10). 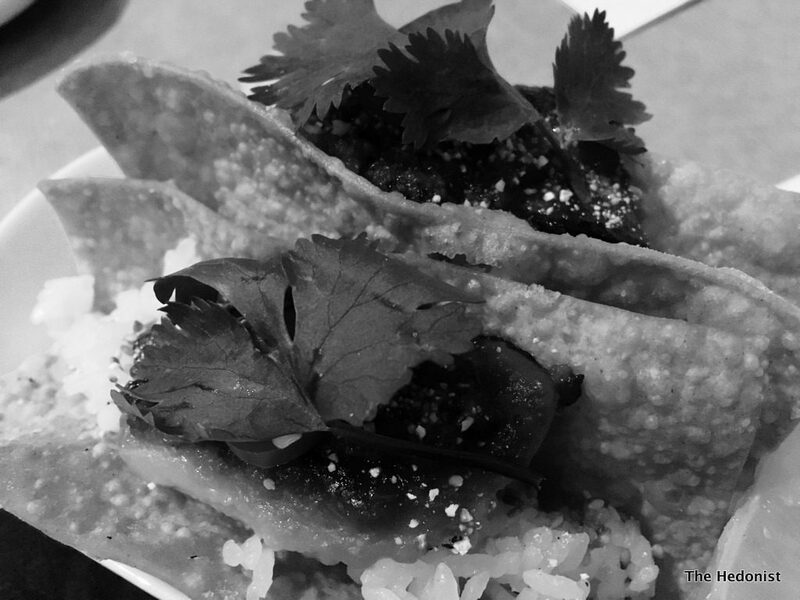 The cod was sweet and melting and it was interesting to have the taco with the rice in a nod to Okinawan cuisine which melded Tex-Mex with Japanese food in the mid-1950s. The celery and pepper notes of Autumn Leaves premium sake sat well with the fish. A signature Kurobuta dish of Loch Duart salmon sashimi pizza with truffle ponzu, Jalapeño and wasabi tobiko (£11) was probably the most exciting plate for me. 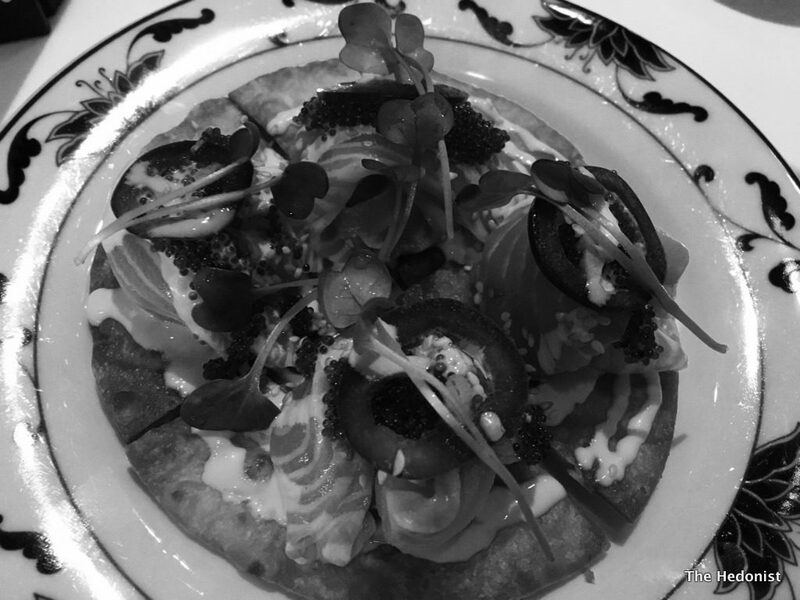 The smoked salmon was good quality with the hint of truffle flavour, saltiness of the tobiko (fish roe) and hot peppers with the crunch of the pizza (taco) base all colliding to provide an amazing mouth sensation. It shouldn’t work but it does! Nasi Dengaku is the classic dish of Miso grilled aubergine with caramelised walnuts (£8). 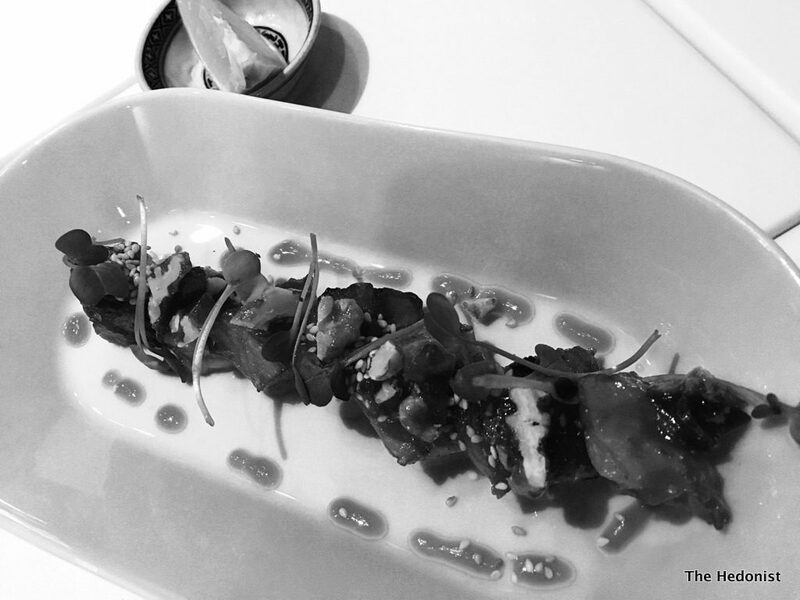 I remember it as a favourite off the Kurobuta menu and the aubergine still had that sweet and luscious taste and texture with a hint of walnut crunch that I loved when I first tried it. We matched it with a Monkey Goes To Heaven cocktail, a smoky mix of ginger, sugar syrup and apple with Monkey Shoulder blended scotch. Seared beef salad with pomegranate, onion-peanut Ponzu and garlic crisps (£11.50) had a perfect char on beef which was beautifully tender with flavour bursting from the garlic, pomegranate and peanut. FreakScene advertises itself as selling ‘curious Asian plates’. 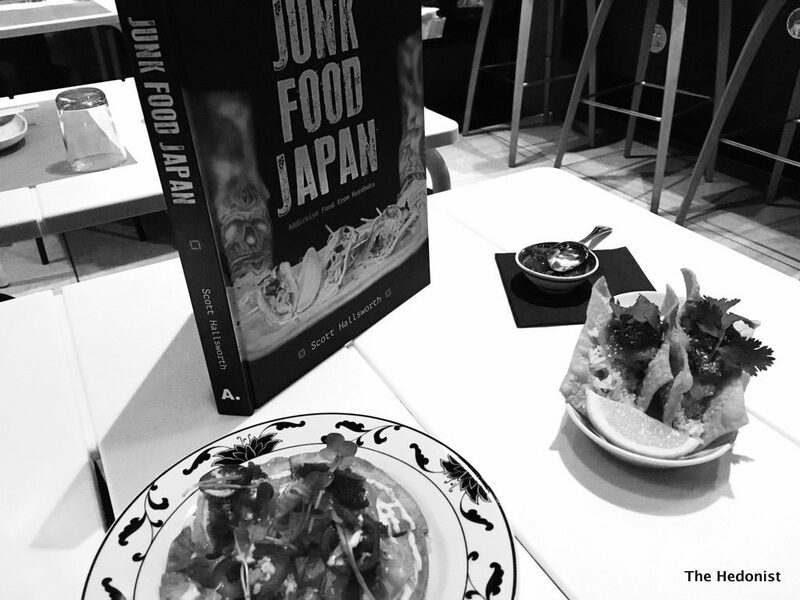 The food is a smash and grab raid on Asian cuisines with flavours colliding and exploding in a way that shouldn’t work but does in an exceptional and idiosyncratic way. The pop-up is a low budget operation with the cooking taking place on two portable burners; but if you crave Hallsworth’s brand of fusion food you really should check out FreakScene while it is still there.